Home » ★★★★☆ » NOW CLOSED : Racine. Paris, the sequel. NOW CLOSED : Racine. Paris, the sequel. Racine. I have no idea if there’s any connection to Jean Racine, the playwright, but other than both of them being uncompromisingly French, I can’t see what they have in common. In that slightly no-man’s-land bit of Knightsbridge, the section past Harrods but just before Brompton Road, and opposite the V & A, this is a strange place to find a traditional-style bistro although given that a there are apparently 270,000 French nationals in London alone, London is effectively the sixth biggest city in France. And a lot of them live in SW7. 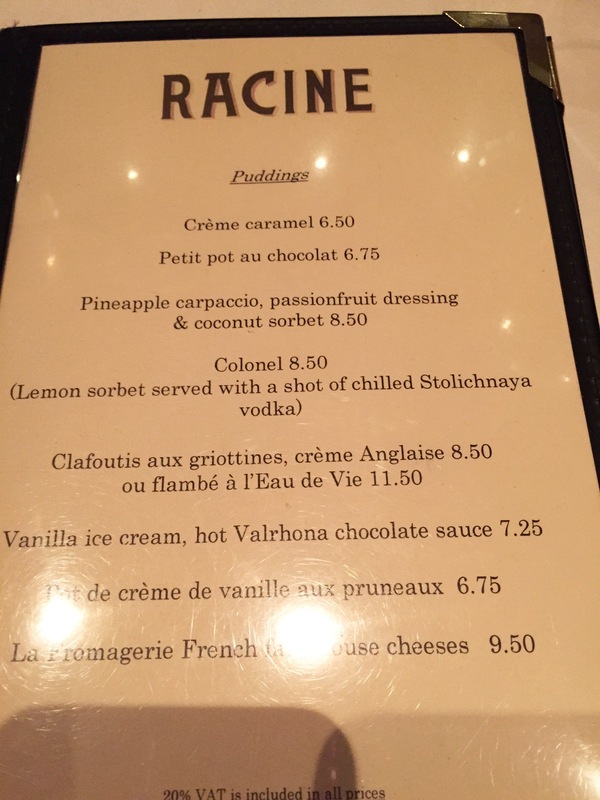 They must be very happy to have found Racine when they arrived, with its classic bistro repertoire, serving such delicacies as soupe de poisson, steak tartare and calves brains. This is the bistro of your imagination, the bistro you might have been to 20 years ago on a trip to France and the sort of bistro that is now quite difficult to find there. No less an authority than Michel Roux has bemoaned the death of the French bistro, which he blames on the working time directive, which has cut down the hours a chef is allowed to do and this, it is argued, has led to the overuse of pre-packed vacuum-packed and frozen food. That’s an intriguing argument isn’t it, strong labour laws = bad food? Clearly not bound by such restrictions, the food here appears to be cooked in the traditional way. Racine is a dark, atmospheric rectangular room, with tables that are rather close together and it can get fairly noisy when it is full. Or maybe I’m just going a bit deaf. Tip: reserve a window table. Run by Henry Harris, who trained with that chef’s chef, Simon Hopkinson, Racine has been operating for 12 years and it is with sadness that I admit that I was only introduced to it a couple of years ago, for it is now one of my standby stalwarts, my safe selections and my fallback French of choice. There’s a legal drama attached, to which I am obviously drawn. It would appear that Mr Harris became executive chef at Soho House Group and then had a dispute with the original joint owner of Racine, Eric Garnier and bought him out in 2008. According to The Caterer magazine, he said “I returned to Racine the day after the court order in which Eric consented to sell his shares and pay £50,000 of our legal costs”. Eric Garnier went on to open – you guessed it – Garnier, with his brother, in Earl’s Court, where they seem to be doing something fairly similar to Racine. Henry was appointed sole director of Racine Restaurants Limited, in 2010, and that is owned by Henry Harris and James Lee. 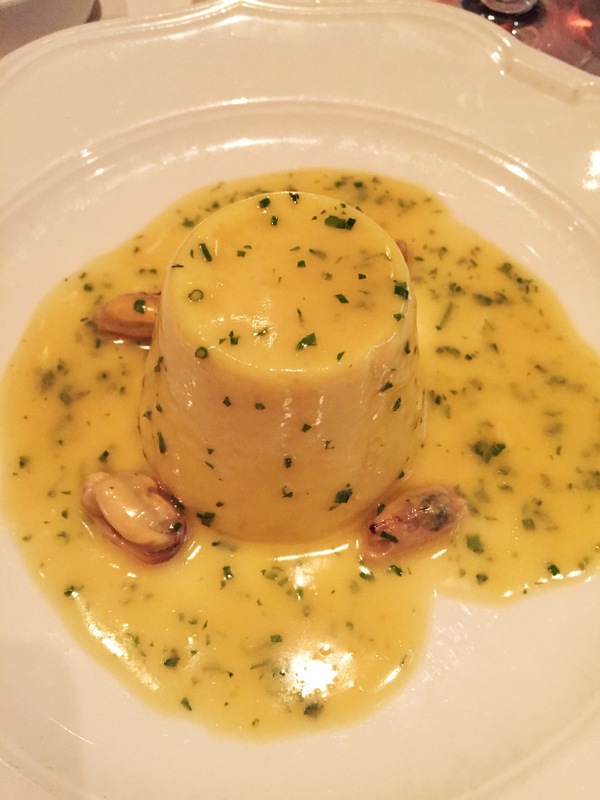 I have eaten here on numerous occasions and I have always found it very difficult not to order the saffron and garlic mousse with mussels, because I know it’s there and I can’t imagine that anything else will be quite as good. A soft, light just-set texture, in a cream and saffron sauce dotted with plump mussels, this is silky smooth and delicious. It’s on the house menu, so it’s always available. You will want to mop up the rich cream sauce with the very traditional baguette loaf that is brought to the table as you sit down. Tip: they keep replacing it until you ask them to stop. If you ever do. My record is three. I started with my normal Kir (good, plenty of cassis) for my dinner with my friend G, who shares with me an abiding interest in eating out and clearly we have the same food taste as, other than dessert, we ordered the same food. I did toy for a second with the crab and prawn cocktail with Poilâne toast, but the siren call of the saffron mousse was too great. 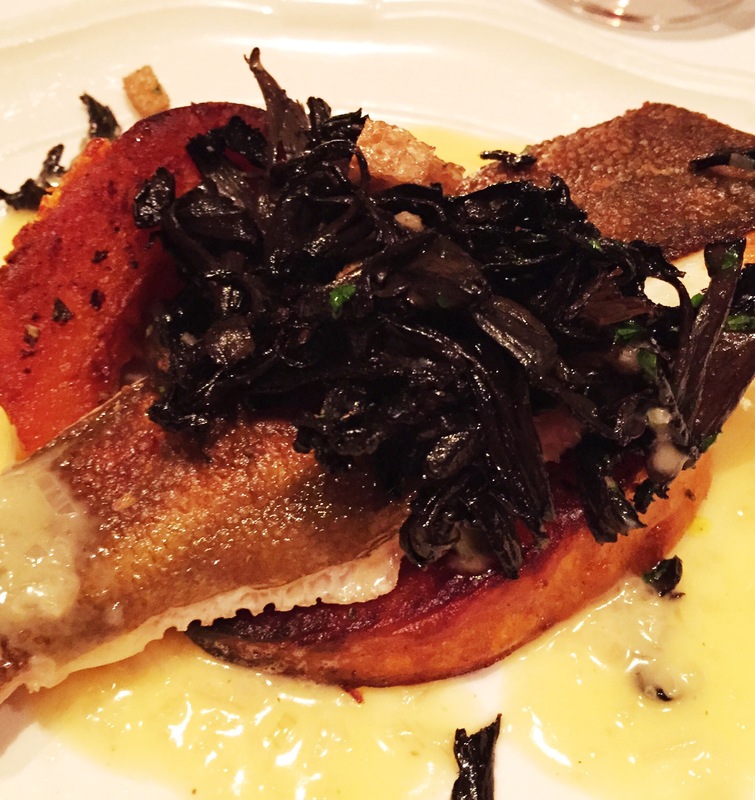 To follow there was tranche of plaice, wild mushroom and croutons, roast pumpkin and beurre blanc. A good piece of fish, topped with trompettes du mort mushrooms, on a buerre blanc with slightly caramelized slices of squash on each side. I liked this, other than the fact that it was trimmed oddly and there were a lot of hidden little bones along the edge. I like to attack a plaice on my own, preferring to dissect it myself and I like the drama of a whole flatfish in front of me. Consequently, I spent a fair amount of the evening trying to remove hidden bones from my mouth whilst pretending not to do so. We also ordered creamed spinach, even though each dish comes fully garnished, because I always have to throw in a little extra dish, just at the last minute. This has foie gras in it, although we passed on that version. 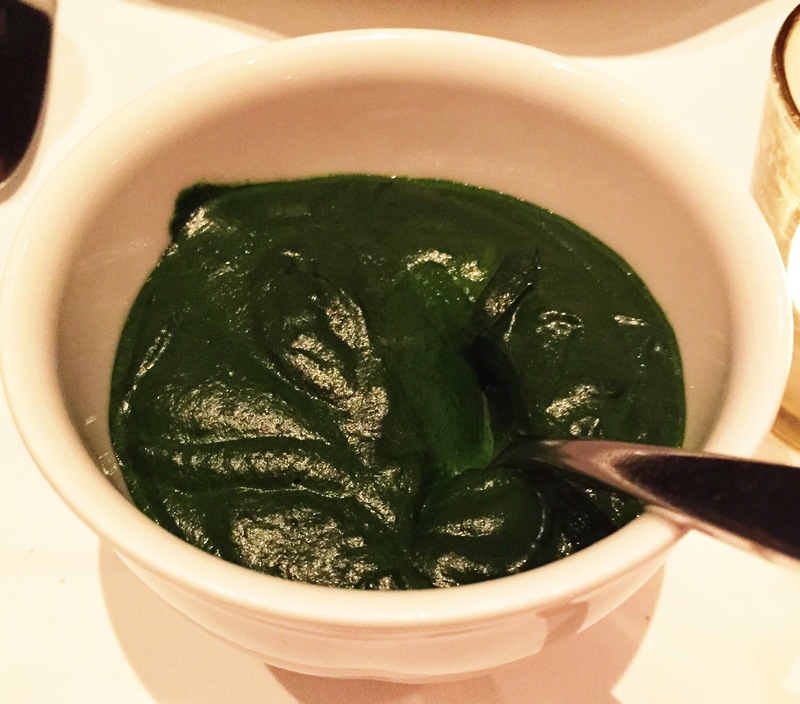 Almost the consistency of ketchup, the spinach was whipped to within an inch of its life. Glossy and smooth, it looked a little lurid and unreal. It tasted good though and I may try to recreate this in the comfort of my own home. We really needed desserts, so G had the cherry clafoutis with crème Anglaise, otherwise known as custard and I had vanilla ice cream with hot Valhrona chocolate sauce. It came with those lovely fine wafers, crêpes dentelles, the ones that come in the gold wrappers and crumble in your mouth as soon as you bite into them. I’d have been happy with a plateful of those, just to dip into the chocolate. I may ask for that next time. Because there will be a next time and a time after that, when I fancy a trip to that French bistro of memory. P.S For those who want to know -£53.74 inc 14.5% service and including 2 glasses of Kir. Look. What’s a girl to do? Nicky, this post has reminded me that it’s time to try Racine again after a gap of many years. But what has prompted me to write to you is that Isabelle and I are big fans of Garnier on Earl’s Court Road, easily the best restaurant around this part of Old Brompton Road. I am told that it is owned by Didier Garnier, Eric’s brother. I believe that the 2 of them also own Le Colombier in South Kensington, but we think that Garnier is the better of the 2 restaurants. Not quite your average bistro food, particularly as the chef is from Menfi in Sicily (one of our favourite towns) and cooks classic dishes with frequently interesting modern variations. And it’s very good value. Well worth a visit. Thanks for this Ivor. I’m keen to try Garneir – will do so shortly and let you know. Still got to try Gauthier!